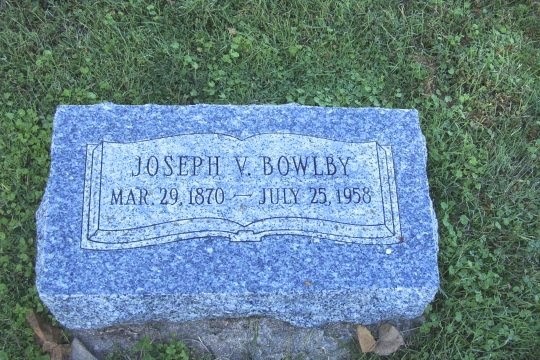 Today’s ancestor is Joseph Victor Bowlby, my husband’s second great-grandfather. Joseph was born 29 March 1870 in Iowa City, Wright, Iowa. He was born to Samuel Bowlby and Rosannah (King) Bowlby. He married Anna Rhoda Greenway sometime in 1900. Joseph and Rosannah had six children: Sherry Victor Bowlby, Percy Richard Bowlby, Richard Samuel Bowlby, Jennie Bell Bowlby, Lillian, Augusta Bowlby, and Thelma Louise Bowlby. Joseph lived with his family in Iowa until he married in 1900 when he moved to Empire City, Cherokee, Kansas. Joseph and Anna divorced sometime before May 1920. He appears alone, marital status showing divorced on the 1920 U.S. census. Joseph remained in Kansas, eventually moving in with his son, Victor’s family sometime before 1940. Joseph died 25 July 1958 in Wichita, Sedgwick, Kansas. He’s buried in Jamesburg Park Cemetery in Wichita, Sedgwick, Kansas.